My name is Tom Van Every and my wife Edna and I operated Van Every’s Engine Services, a business that began as a family auto repair facility, and evolved to Maintenance program management and consulting. After almost 40 years of mechanical experience with military weapons systems as well as automotive and light trucks, I’ve found sound maintenance practices the key to well operating machines of all kinds. This website is dedicated to our AMSOIL business, Full Circle Synthetics, and the customers that buy AMSOIL products; our dealers, preferred customers and retail/commercial accounts. No business takes place until a product is sold, the AMSOIL business is no different. The magic starts when a customer gets a high quality product, a profit is made, commissions are paid and business is being done. Maintenance is the key to the longevity, reliability and efficiency of any vehicle with the use of high quality lubrication and filtration. I recommend and use exclusively, AMSOIL synthetic lubricants and filtration products because in my experience I’ve found none better. Synthetic lubrication is the state of the art lubrication technology, just as engines, transmissions, and computer controls have evolved, lubricants have evolved as well. AMSOIL is “The First in Synthetics”. Our mission is to help anyone interested in AMSOIL, to benefit from use of the products, to build a business. 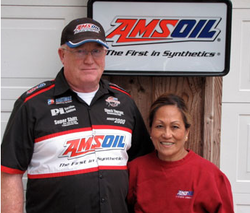 AMSOIL is a way of life for us and we would like to help you with all of your 'synthetic oil' needs. To provide assistance to those in need in our community in an impartial and dignified manner. We will provide supplemental/emergency food, Salvation Army prescription vouchers once a year, and telephone health and welfare checkups via our tele-care program. We will work with other human service agencies in our community to ensure that we are prepared to offer the best possible assistance possible and assist wherever possible in not only improving lifestyles, but striving towards independence from the need for assistance. We shall keep the client first and foremost in all our actions, ensuring confidentiality and dignity punctuate all we do. Automobile manufacturers generally warrant their vehicles to remain free of defect in manufacture or workmanship for a certain mileage or time period. Whether an automaker will honor a warranty claim depends on the vehicle owner providing proper maintenance for the vehicle. For this reason, it is important for vehicle owners to maintain maintenance records. Proper maintenance includes installing appropriate oil and filters.